Turkey has refused to extradite Iraqi Vice President Tariq al-Hashemi, who is now facing a death sentence in Baghdad. Turkey has refused to extradite Iraqi Vice President Tariq al-Hashemi, who is now facing a death sentence in Baghdad, according to the website Voice of America. Mr. Hashemi fled to Turkey after Iraq's Shi'ite-led government issued the terror charges against him in December, the day after U.S. troops withdrew from the country. Turkish Prime Minister Recep Tayyip Erdogan told the press on Tuesday that Mr. Hashemi may stay in Turkey as long as he wants and that Ankara will not have him sent to Iraq. Al-Hashemi, a Sunni Muslim, received the death sentence handed down by an Iraqi court as an “act of political retribution by the country's Shi'ite Prime Minister Nouri al-Maliki,” according to the report. He faces a death by hanging, according to Fox News. On Monday, Hashemi accused the Iraqi prime minister of manipulating the court to oppress him, according to Voice of America. Hashemi rejects the verdict. The Kurdish President of Iraq, Jalal Talabani, says that the timing of the al-Hashemi verdict is “regrettable” because as VP, he still remains in office. The verdict could help spur an all out civil war in Iraq. Sunday's ruling convicted Hashemi, in absentia, of murdering a Shi'ite security official and a lawyer. Hashemi insists the rulings were politically motivated and he will not be returning to Iraq to challenge them under what he called a “corrupt” judiciary, according to Voice of America. Sunni ministers and clerics who support Mr. Hashemi accuse Prime Minister Nouri al-Maliki's government of wrecking the nonsectarian shape the government is meant to take. Meanwhile, “Underscoring the instability, insurgents unleashed an onslaught of bombings and shootings across Iraq, killing at least 92 people in one of the deadliest days this year,” reported Fox News on Wednesday. 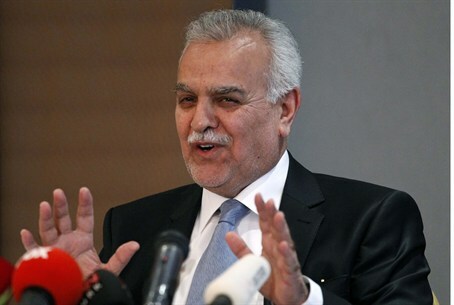 According to sources, Tariq al-Hashemi says he will be giving a statement to the press in Turkey in the coming hours.